Elements for fiddling such as: ribbon, pompoms, net, braid, lace, zippers, giant rickrack, Velcro, straw, crocheted or knitted squares or flowers, parts of clothing (such as pockets, cuffs or shirt plackets), Suffolk Puffs, Prairie Points, labels from clothing, sewing elastic, rubbery shelf liner, small drawstring bags, hair scrunchies etc. A Fiddle Quilt must be washable in hot water and dried in a dryer, especially if made for use in a public institution. Pre-wash all fabrics and elements for fiddling at a temperature of at least 40°C. Use highly contrasting fabrics to achieve visual interest either in colour or pattern. Interestingly, colours in the blue-violet range all look the same to dementia patients—their retinas have more receptors to see shades of red, so choose red, orange and bright pink fabrics to attract their attention. However, keep in mind that some people may not wish to have a dazzling pink quilt, or may prefer calmer colours so in fact, the range of colour combinations is endless. Try to avoid black. If you are making the quilt for a specific person, of course choose their favourite colours! Themed/novelty fabrics that will trigger memories or happy thoughts are desirable as they may help patients to remember a forgotten part of their lives. Photo transfers of family, friends, pets, etc. can also be a thoughtful addition. If the recipient was a quilter or crafter, try to include some of these elements to bring back pleasant recollections. Everything needs to be safe – eg impossible to pull off and with no sharp edges. This workshop will give you a great chance to clear out your drawers of those items you can’t really use but can’t bear to throw away. 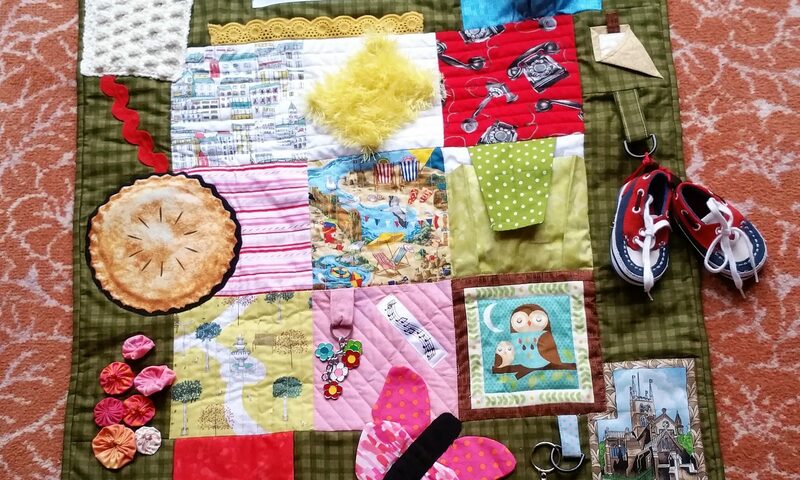 I found that collecting items for my Fiddle quilts was very cathartic!